Now this is the book for you if you want some new ideas. The author presents so many thought provoking ways to approach the designing of quilts. Both the contemporary and traditional quilter will applaud this book that links contemporary and traditional. She has put in little lessons for us to do after each chapter. This would be a wonderful book to go thu with a friend or two. Going thru it with a quilting program like Electric Quilt would even make it even a more valuable experience since you could see results faster. This book is inspirational and extremely informative. I love it!!! This extraordinary book is a natural sequel to Joen Wolfrom’s best selling The Visual Dance. 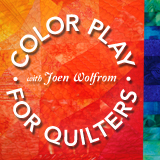 Joen shows you how to alter traditional patterns and create your own original designs. The ideas on block settings will excite you and start you in new directions. Her “A Gallery of Creative Inspiration” and “A Gallery of Joyful Innovation” will get you in the right mind set, but “Taking a Creative Leap—Planting a Seed, Watching It Grow” will give you the start or the inspiration that you need. An excellent resource for Quiltmakers of all skill levels, and invaluable reference for quilting instructors. Joen started developing ideas for her book in the late 1970s. “I began paying closer attention to the block patterns I chose for my quilts,” she says. “Whenever I became disappointed, I tried to assess the reasons. I found there was an art to block selection and eventually I gained enough courage and experience to make other determinations about block interaction and overall settings. Patchwork Persuasion is a compilation of Joen’s observations on block design. Subjects include enhancing one-block designs, blending and merging blocks, blocks with moving parts, and altering traditional favorites. More than 200 color illustrations and 100 quilt photos effectively demonstrate her ideas. This book will be helpful for those who want to personalize commercial patterns or design their own quilts made from blocks. For those of you who are in the middle of using Harriet Hargrave’s tests on your stash of fabrics and wondering what to do in the meantime, have we got a book for you! Joen Wolfrom was profiled in TQ in 1994. Those of you who remember that interview will also remember Joen’s fantastic quilts. Have you ever pieced together a very traditional block on block quilt, only to discover that everything somehow ran together in the primary and secondary designs? (The primary design is the block itself, such as Bear’s Paw or Hole in the Barn. The secondary design is where the blocks meet to form another design altogether.) I have! It is not a happy surprise. I always assumed that it was my poor choice of colors. That may well have played a part, but only a part. Joen has separated and defined block placement. I am not talking about sashing. I am talking about placement and count for blocks, both horizontally and vertically, as discussed in her chapter “Enhancing One Block Designs.”After reading this chapter, I knew immediately what had been the truly major part of my problem. The chapter “Superb Block Marriages” covers how to pick and use a second block for a dynamic quilt. “Wonderful Blocks with Moving Parts” instructs us on how to add or remove lines from a pattern or even remove parts of the block. This is a fun chapter that demonstrates how to play with design in a very nonthreatening way. At the end of each chapter, Joen offers a work assignment called “Activities and Extended Learning.” This is an opportunity for readers to put into practice what they have just learned from a chapter. All in all, this is a superb workbook for creative design from traditional blocks. It is done in a cohesive, easily understood step-by-step manner with hundreds of color photos. What’s more, it is a real page turner. You cannot wait to get to the next chapter to see what more can be done with blocks! Perhaps what is best about this book is that you never doubt that you can do what you are reading. Congratulations Joen and C & T on an outstanding book! I highly recommend it to quilters from beginner to advanced. All quilters can create dynamic, imaginative quilts using Joen’s block enhancement ideas. Change blocks by adding or eliminating design lines, removing block sections, rotating, staggering or floating blocks. Stretching, squeezing, blending, merging—these block manipulations can be simple or complex. Inspiration is the name of the game with this book. Over 200 color illustrations, 18 activities, and photos of over 100 quilts. If you prefer traditional quilt patterns, you will profit from Patchwork Persuasion by Joen Wolfrom. The old favorites are here, but they have been given new life by shifts of color, changed value, matched with a second block, and so on. Dozens of illustrations and photos of actual quilts allow you to see how it can be done. This is an excellent book, rich with ideas and practical suggestions. An excellent book for quilters who enjoy making traditional patchwork blocks but would like to make their quilts more contemporary. Dozens of new design ideas for altering traditional blocks are clearly described and illustrated. Over 100 quilts by quilters from many countries, including Canada, are showcased in full colour. A quilting friend once watched me struggle with a watercolor painting. I was not happy with the effect I thought I wanted. Nancy commented, “That’s why I paint with fabric.” Indeed she does, and she does it well. Patchwork Persuasion by Joen Wolfrom shows in detail how to create such works of fabric art. She begins with a section titled “A Gallery of Creative Inspiration,” and it definitely inspires. This chapter includes more than 20 color photos of a wide variety of breathtaking quilts. Represented are conservative classic designs, such as Koinonia Garden by Arlene Stamper of San Diego, and includes a warm wonderful visit to the seaside called Bethany Beach by Beth Gilbert of Buffalo Grove, Illinois. Many other quilt photos are presented throughout this book, including my all time favorite, In Praise of Poppies by Emilie Belak of Grand Forks, British Columbia, Canada. Wolfrom provides inspiration and very practical instructions for folks wishing to “paint” their own masterpiece. Grids and drawings help the rank beginner and the seasoned veteran perfect their craft. The author coaxes and nurtures readers into stretching their wings, taking risks, and testing their courage to use shape and color in new ways. This book inspires, challenges and educates, all at the same time, and it would make a cherished addition to any quilter’s library.